Design for Six Sigma (DFSS) is a separate and emerging business-process management methodology related to traditional SIx SIgma. 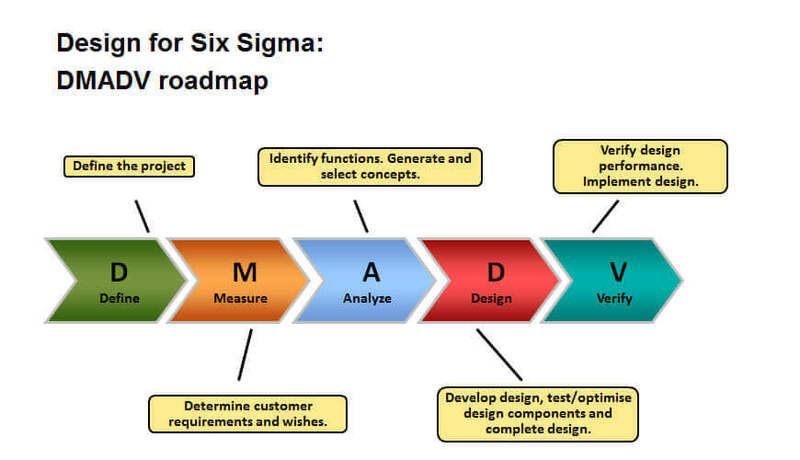 Unlike Six Sigma, which is commonly driven via DMAIC (Define - Machine - Analysis - Improve - Control) projects, DFSS has DMADV, define - measure - analysis - design - verify, is sometimes synonymously referred to as DFSS. Six Sigma DFSS training using the D-M-A-D-V roadmap. The body of knowledge covered by this course is focused on DFSS for Process Design and / or Product Design. Participants in this course should have previously mastered the Six Sigma Green Belt body of knowledge. Communicate using Design for Six Sigma concepts. Identify areas within your existing development process where DFSS is needed. Integrate DFSS into your existing development process. Select optimal process design concepts. Use analytical and experimental methods to develop robust and reliable designs. Modify designs for optimal performance based on variability of the inputs and desired outputs. Verify that the designs meet the requirements at the desired level of performance.